The oldest known member of Kedous / Kdous / كدوس family is Othman / Osman / عثمان. Family members are not agreeing about the second of the lineage. For most of them, Ali is the son of Othman. But for Mohammed Kedous, living family encyclopedia, Hassan is the son of Othman. Also, 5 or 6 generations exist between Othman and Tahar Kedous, born in 1911. According to family tradition, Othman Kedous was an ottoman soldier or officer. He came from his native region of Turkey to Kelibia / Qalibiyah / قليبية to serve or command in the fort. He was also named Othman Boulakbèche / Boulakbech, which means commander in arabic. Kedous patronym would come from the birth place of Othman, a turkish locality or island, possibly named Cadus. An other family of Kelibia Lingliz / Lengliz, which means English in tunisian arabic dialect, would have for origin british person, slave or butler or soldier, living in Kelibia at the same time than Othman Kedous. Maternal grandmother of Tahar Kedous was Makhbouba Lingliz. Numerous existing families of Kelibia and Cap Bon have patronyms related to ottoman empire, for example, Bosnia (Bouchnak / Bouchnek), Albania (Larnaout) or Crete (Gritli). This particularity is noteworthy because family names became mandatory and official in Tunisia only in 1929, while turkish influence has vanished during 19th century. Today, in Kelibia, 2 families are named Boulakbech and Lingliz. At the beginning of 18th century, the new bey Hussein I strengthen his grip on Tunisia by inceasing his army with ottoman troops. The turkish militia of Tunis was around 4 000 soldiers. These regiments, like a modern army, were regularly receiving fresh troops. The new soldier were recruited by the oukil, the representative of the Bey in Istanbul. At the beginning of 19th century, the flow of turkish troops almost stopped. These soldiers were coming from the whole ottoman empire. Some of them were janissaries i.e. christian children kidnapped to be raised as soldiers. The fort / bordj of Kelibia was an important garrison, protecting the corsair boats of the Bey sailing and chasing in the Strait of Sicily. Louis XV, king of France, tried to curb this corsair activity. His Navy shelled twice Kelibia in 1769 and 1771. To protect his corsair business, the Bey requested the help of european military advisers, mainly British. Latin letters, transcripts in english, french, latin, italian, spanish, dutch & german languages: Cadi, Dschedis, Gadis, Ghediz, Ghiedis, Ghieditz, Guédoss, Gjedis, Kadis, Kedous, Kédous, Kedus, Kodus. This city, with now 18 000 inhabitants, in turkish province of Kütahyia, is named Gediz in modern turkish language with latin letters. Gediz was named Κάδοι in old greek language and was transcripted into Cade, Cadenus, Cadi, Cadis, Cadorum, Caodicée, Cidyessus, Kadi, Kadoi. Latin letters, transcripts in various languages: Ghediz-Tchai, Ghediz-Tchaï, Guediz Tschay, Kadischay, Kédous, Keduschay, Kodossu, Kodus, Sarabad, Sarabat, Sarabet, Sarabut, Sarbat, Sarobat. Old greek language: Ερμος, Hermos, Hermus. There is no island in Mediterranean Sea with a name close to Kedous / كدوس. Most of the soldiers serving the Bey were coming from Anatolia or Balkans up to beginning of 19th century. The fort of Kelibia was of garrison of the bey with some Bristish advisers during 18th century. Anthroponymy attests presence in Kelibia of persons with East-Mediterranean or Balkan ancestry in Cap Bon region. Most of the soldiers who came from Anatolia in the militia of the Bey stayed in Tunisia. 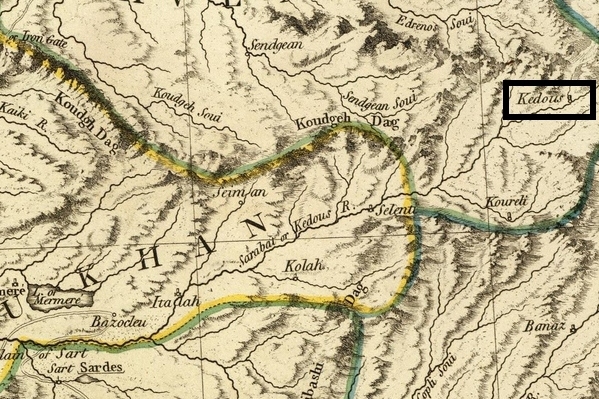 The town and river of Anatolia, known now as Gediz, were named Kedous / كدوس up to 19th century. Othman Kedous is probably born between 1690 (6 generations of 37 years) and 1810 (5 generations of 20 years). No confirmed genealogical link exists between Boulakbèche & Kedous families. British origin of Lengliz family is not documented. Othman Kedous / Osman Kdous / عثمان كدوس was born around 1730 in Anatolia, in the city of Gediz ou close to the river Gediz Nehri. Around 1750, he is recruited in Turkey by representatives of the Bey of Tunis, went to the garrison of Kelibia and founded a family. Ali Kedous is his son and Hassan his grand-child. The above scenario is likely but not confirmed. Any information or question, confirming or invalidating these assumptions is welcome. Thanks in advance for any contact. All the references are detailed at the bottom of the French version of this page.